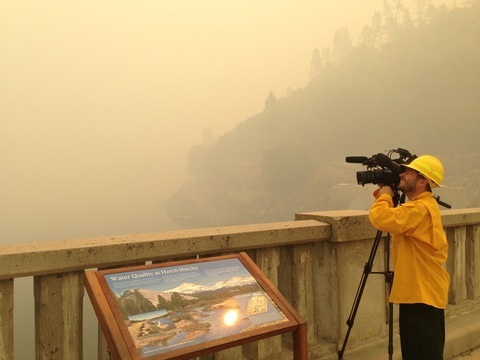 PBS NewsHour producer Cat Wise and videographer Jason Lelchuk were among the first film crews allowed access to the Hetch Hetchy Dam, which is in the fireline of the massive Rim Fire in Yosemite National Park. Photo by Cat Wise. Tonight, the NewsHour will air a piece on the race to save centuries-old giant sequoia trees in Yosemite National Park, threatened by flames from the massive Rim Fire, which are leaping dangerously high into the treetops. 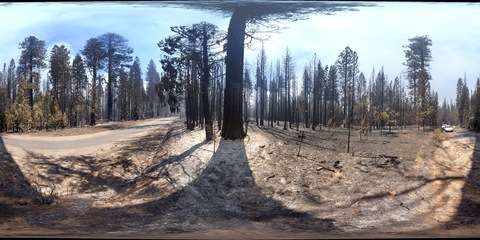 By Friday, the fire — now ranked as the fifth-largest California wildfire on record — was 32 percent contained, but had already burned through more than 200,000 acres of timberland forest and dry scrub, three-quarters of that in Stanislaus National Forest west of the park, where the fire began. In some ways, giant sequoia trees benefit — actually, depend on fires. 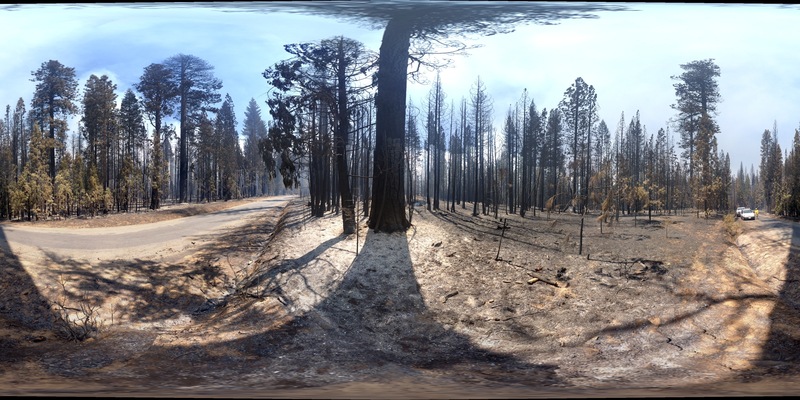 In fact, while it may seem counterintuitive, more fires over the past century would have weakened the Rim Fire’s power, according to Malcolm North, a research scientist with the U.S. Forest Service, who I spoke with this week. Here’s why. There are two kinds of fires. One is healthy for the giant sequoias; one’s not. 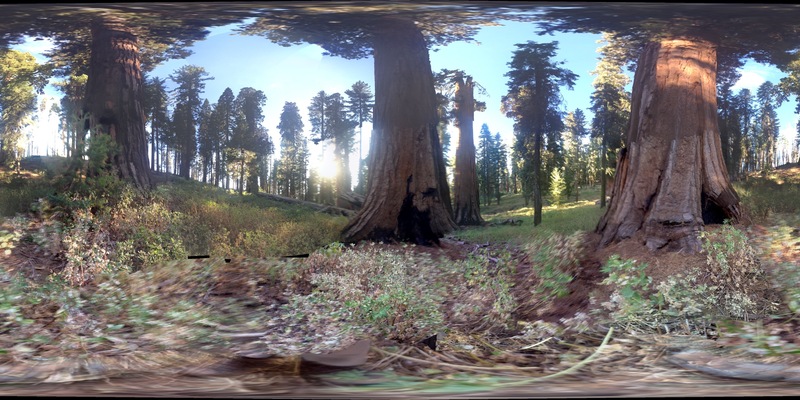 Smaller, so-called “ground fires” help the sequoias thrive. Heat from the fire opens their pine cones, allowing them to release and disperse the seeds, and the fire itself clears shade, providing light for these seeds to grow. Plus, as mentioned in tonight’s piece, the trees have their own built-in defense mechanisms to protect against fire — that includes a natural flame retardant in their thick bark. 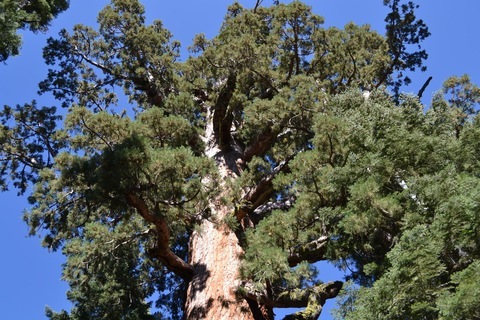 For a giant sequoia whose trunk stretches 10 to 15 feet in diameter, the bark can be as thick as 1.5 feet, which also provides strong insulation against fires. But certain high-intensity fires become too much for the trees to handle. In the case of a “crown fire,” flames leap to the treetops, burning all vegetation and that kills the trees, according to National Park Service ranger Tom Medema. The concern is that flames from the Rim Fire will reach the tops of the giant sequoias and kill the trees. Giant sequoias are the world’s largest tree by volume and among the oldest living organisms on Earth. Photo by Cat Wise. In Yosemite, a century of fire suppression has worsened these dangerous, high-intensity fires, placing the giant sequoias at greater risk, North said. Most forests burn naturally every 10 to 15 years, and as they do, material on the forest floor, such as dead pine needles, wood, acorns and debris, are burned off. In the absence of such fires, this material accumulates, providing powerful fuel when a fire does occur. Interestingly, Yellowstone National Park withstands high-intensity fires much better than Yosemite, because it’s trees are adapted to them, North said. In Yellowstone, fires are historically less frequent, but more intense, burning mass amounts of fuel and reaching the crowns of the trees. “What’s different is those forests evolved with those kinds of fires for centuries,” North said. And Yellowstone’s lodgepole pine has pine cones that release seeds in such fires, allowing the forests to regenerate within five to 10 years. “Several scientists, myself included, are saying it might be a good time to reevaluate the policy of putting out and suppressing all fires,” North said.